A bustling New England township had a local fire station that was bursting at the seams. After several years of stops and starts, the city was finally ready to move forward with a multi-million-dollar construction project to build a new fire station. The plan included demolition of the existing building and rebuilding the new structure on the same site. The problem was how they were going to maintain a working firehouse in the interim. A project management firm had recently been hired to oversee the fire station construction and a couple of other city projects. They proposed a temporary structure be installed across the street to serve as the city’s fire station. It needed to be large enough to house the first responder staff and firefighting apparatus. 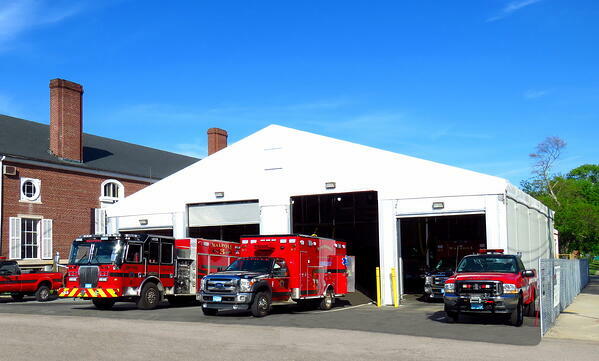 The City’s project management team needed to partner with a vendor who preferably had past experience and success in installing temporary fire stations. It wasn’t long before Mahaffey’s name rose to the top of the list. Mahaffey was awarded the job based on our past portfolio, the results of our previous fire station projects, and our solid reputation as a turnkey vendor in the industry. The greatest challenge for the end user was having a structure that was durable enough and customized appropriately to meet the needs of a busy fire station and its inhabitants. The structure would need to survive the harsh climate that comes with winter in New England including snow and rainfall. Additional requirements included a lease that would allow the structure to remain on site for at least a year and a half. Could be installed on a timeline that aligned with the scheduled demolition. Would remain onsite for over a year. Would have multiple bay doors. Was engineered to withstand harsh winter winds and snow loads. Could fit into an existing location. Mahaffey’s project manager became deeply involved from the design phase. He worked closely with designers and engineers to develop the best solution for the fire station. After careful consideration of the details and requirements, Mahaffey proposed using the MegaStructure™ product. The MegaStructure™ consists of a sturdy aluminum box beam structure that can withstand extreme winds up to 130 mph, combined with a snow load up to 30 lbs. per sq. ft. It was designed to be used for semi-permanent applications and engineered for harsh climates. It fit the fire station project’s needs perfectly. To adapt the structure for inhabitants and climate, Mahaffey proposed using insulated wall panels and heating. For the first responder vehicles to be able to leave at a moment’s notice, motorized bay doors were recommended. Additional features customized for the fire station included circulating fans, an exhaust ventilation system and an LED lighting package. The Mahaffey installation team took the temporary structure from an empty asphalt pad to fully-functioning 5,000 sq. foot fire station in a ten-day timeframe. 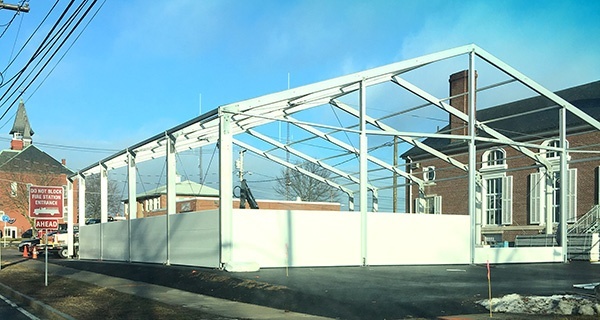 The temporary structure remained for seventeen months as a fire station in the township allowing first responders to continue the important work they do without interruption while the new station progressed. The end client response was positive and remarks were made regarding how helpful it had been to have a turnkey services vendor. In today’s times, it’s hard to find a vendor partner that can offer support through every phase of your project. Mahaffey can do that. We offer turnkey resources from start to finish, backed by over 90 years of experience in the industry. Do you have a project coming up that calls for a partner with a full line of customizable turnkey solutions? If so, call our expert project managers at Mahaffey.